The Wood Turtle Working Group was formed in 2009 at the NEPARC meeting in Watkin’s Glen, NY. Over 20 people attended the inaugural meeting. In 2012, about 35 people were involved in the working group meetings at Crawford Notch, NH. As a result of working group coordination, a status assessment and conservation planning process was initiated in 2011, and was funded in 2012 by the Northeast Association of Fish and Wildlife Agencies (NEAFWA)’ Regional Conservation Needs program (RCN), which is funded through state-level contribution of State Wildlife Grant (SWG) funds. One of the objectives of the status assessment and conservation plan is to improve coordination among field researchers. In this way, NEPARC is playing a critical role. A network of 20 long-term research sites have been identified from Virginia to New Brunswick, which will be sampled following a standardized protocol in the fall of 2012 and 2013. Additionally, a network of “rapid assessment” sites are being established following a standardized protocol throughout the northeast region. Data collected through these collaborative projects will be incorporated into the status assessment, which is being coordinated through UMass/USGS Massachusetts Coop Unit. 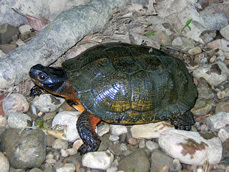 By 2012 the working group had accomplished many of its original objectives, including: contact Canadian representatives, investigate the feasibility of a Wood Turtle Status Assessment, identify point people from each state, develop monitoring protocols, identify NGOs that may be of assistance, etc. The focus of the working group has temporarily shifted to the implementation of the monitoring protocols and the development of the status assessment. The Conservation Plan will be completed in June 2014. For more information on this effort visit: www.northeastturtles.org. If you are interested in joining the Northeast Wood Turtle Working Group, email Tom Akre or Mike Jones.